Sourcing has a fundamental problem: All searches return results. Yes, that is actually a problem. Why? Because everyone’s a winner. Type in a few keywords and BAM! – you get some good looking results. Hey, this sourcing stuff isn’t so hard! If I’ve said it once, I’ve said it a thousand times – sourcing is easy. In fact, it’s ridiculously easy to find some people. So if you and your company are happy with finding some people and not necessarily the best people available to be found, then you can stop reading now and go back to finding some people. Can you ever be sure you’re finding everyone there is to be found? How do you know you’ve found the best people available? How do you know you’ve found all of the best people? Are there people on LinkedIn, in your ATS, in job board resume databases that are never found? How can you be aware of social media profiles and resumes that your searches can’t return in results – but are there? Sourcing is easy, but it’s not easy to get to the point where you are sure you have found all of the best available results, nor is it easy to specifically target and find people others cannot and do not. Most people use relatively basic, straight forward/direct keyword and title searches. There’s nothing wrong with that – they clearly “work” – anyone running those kinds of searches will find results. However, they will also find exactly what everyone else finds when searching for the same types of people, which yields zero competitive advantage. The fact that all searches produce results is a problem because it lulls people into thinking that sourcing is easy, and at least on the subconscious level – it leads people to believe that the results that are returned from searches represent all available matching and relevant results. However, it is a fact that no single search can find all of the people you’re looking for, and there are many social media profiles and resumes that are never found. 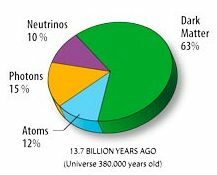 Let me introduce you to the concept of Dark Matter. People who use relatively straight forward/direct keyword and title searches find the same people as everyone else using the same keywords and titles. What’s particularly interesting to me is the fact that everyone running basic, straight forward/direct keyword and title searches also fail to find the people who are there to be found, but cannot be found via straight forward, direct searches. These profiles are what can be referred to as “dark matter” – which, in layman’s terms, is stuff that’s there, but you can’t see it and it isn’t directly detectable. I’ve found that people have an especially difficult time understanding that every search they run both includes some of the right people, and excludes some of the right people. My last LinkedIn sourcing challenge provides a good example of that. Many respondents could find matching results, but did not seem to grasp the concept of ensuring that their searches did not exclude viable, available results. To some degree, that’s understandable, because it’s difficult to be aware of what you cannot see. However, just because your searches didn’t return a result, it doesn’t mean they are not there to be found. So what happens to the people that are excluded from your searches – the people your searches don’t return, the people you’re not even aware of? Well, it should be obvious that very few people find them, and those that do typically do so by mistake and not through a direct effort to uncover them. I’m going to use a few very basic examples in an attempt to clearly illustrate what I’m talking about with regard to profiles on LinkedIn that most people #1 aren’t even aware of, and #2 cannot be found via conventional search approaches. For these examples, it is very important that you don’t get caught up on the actual search terms I use – the terms themselves are irrelevant. What is relevant is the concept behind what’s being demonstrated. It’s up to you to absorb the concept and apply it to whatever types of people you are trying to find. Let’s say you’re looking for a software engineer and your manager is very clear that she needs someone with strong Java/J2EE skills and experience. Most people searching for software engineers with Java will search for “Java.” As obvious and innocent as that would seem, doing so creates dark matter profiles. For those of you who do I.T. sourcing and recruiting, you will quickly identify that the vast majority of the people returned by the above search to be software engineers who quite obviously have Java experience, yet they do not mention “Java” – their primary development language – anywhere on their LinkedIn profile. 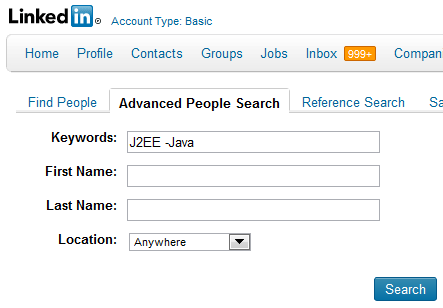 Why would a Java developer not explicitly mention “Java” on their LinkedIn profile? I know why – do you? Let’s say you’re looking for accountants, and your manager tells you that they must be CPA’s. Of course, you can find people by searching for all of the various ways someone can express being a CPA – (CPA OR “Certified Public Accountant”). You might even get crafty, realizing that LinkedIn sees “C.P.A.” as distinctly different than CPA and add that to the OR statement. There are nearly 5,000 people in all of LinkedIn that cannot be found unless you specifically search for “C.P.A.” – here’s the proof. However, searching for any variant of CPA is still a very basic and direct method of searching for people who are CPAs. After getting over 600,000 profiles returned from my initial search targeting a current or past title of “Accountant” and specifically excluding any mention of CPA, I filtered the results by people who specify that they currently work for either Deloitte, PwC, KPMG or Ernst & Young. Those results represent more than 10,000 accounting professionals who work for Deloitte, PwC, KPMG or Ernst & Young that simply do not exist to anyone searching for (CPA or “C.P.A.” OR “Certified Public Accountant”). Why would a CPA not make explicit mention of it on their LinkedIn profile? The darkest dark matter profiles on LinkedIn are those of people who use very few, if any words that give you any real clue as to their specific skillset or experience. These profiles are often never found, because any obvious keyword will prevent them from being returned in search results. To reveal and target these profiles, you have to exclude the more obvious keywords that most people who actually use. For example, if I were looking for software engineers, but did not want to see the profiles that everyone else is finding, I could target a current title of (“software engineer” OR developer OR programmer) and try to exclude most major technologies with -(“java/j2ee” OR peoplesoft OR perl OR oracle OR SAP OR java OR j2EE OR .Net OR C# OR C++) in the keyword search field. There are almost 1,000,000 profiles returned by that search, check them out here. There’s nearly 13,000 of them from IBM, 12,000 from Accenture, and over 4,000 from Google. Any sourcer or recruiter who puts Java, PeopleSoft, Perl, Oracle, SAP, J2EE, .Net, C#, or C++ in their search is simply not aware that the nearly 1,000,000 people I just found with the above search even exist because they will be excluded from their search results. Why would you want to look at profiles of software engineers who don’t mention any particular technology on their LinkedIn profile? One way of discovering Dark Matter profiles is to conduct a form of Talent Mining I refer to as Indirect Search. There are many applications of Indirect Search methodology, including the 2 examples I shared above, and you can also see some in action among many of the proposed solutions to my Ruby LinkedIn Sourcing Challenge. The challenge really was an example of Dark Matter profiles on LinkedIn – I asked readers to find people on LinkedIn who had Ruby on Rails experience, but did not mention any variant of Ruby on their LinkedIn profile. Many people who solved the challenge had to go indirectly search for LinkedIn profiles by first going outside of LinkedIn to find information on people that alluded to Ruby experience, and then cross reference the name on LinkedIn to see if the person’s profile did or did not mention Ruby. While that is one form of Indirect Search – finding people on LinkedIn with specific experience by finding them first elsewhere – how could you find people with Ruby experience on LinkedIn who do not make any explicit mention of it on their LinkedIn profile, AND they don’t have any other info elsewhere on the Internet to give you easy clues indicating that they have Ruby experience? While some people feel semantic search solves all sourcing problems (vendors, mostly :-)), semantic search isn’t the solution to the Dark Matter challenge, for a number of reasons – not the least of which is that semantic clustering and other applications of machine learning can only work (semi)reliably with what is actually there/mentioned. Even the most advanced NLP algorithms are limited to “analyzing” and “learning” from text. What happens if the text isn’t there to analyze and learn from in the first place? While there are solutions that are going to become available that claim to use semantic search that can cross reference LinkedIn profiles with other social media profiles and help identify people who may reveal some information via Twitter or other networks that they do not on LinkedIn – that too only works with information that is directly retrievable. As you can see even from the extremely simple examples I demonstrated above, it is actually necessary to think and purposefully construct indirect searches for implied experience or qualifications in order to reveal Dark Matter profiles – those that cannot be seen/found by direct searching methods. It’s also interesting to note that more powerful forms of Indirect Search require the strategic exclusion of direct search terms – something I am not aware that any semantic search application allows. Does anyone know of one? Before I get flamed by the semantic search vendors and fanboys/girls – I’m passionate about semantic search, and I’ve actually used most of the “big name” solutions on the market. I also perform semantic search manually at the most powerful level (sentence level verb/noun combos) to help fill job openings just about every day – ask me how if you’re interested. Because I really understand and appreciate information retrieval – both manual and automated – I feel it’s my duty to keep vendors who are selling semantic search as the solution to all sourcing/recruiting challenges honest and to inform people who may be considering purchasing solutions that there are limitations of semantic search. I’ll be writing more on the subject very soon, but I’d like to illustrate another issue with “semantic search” solutions that vendors won’t volunteer: If 5 companies who are constantly battling it out for top talent all use the same semantic search application, all 5 companies will find all of the same people. That means no competitive advantage. Perhaps even more importantly, they’ll also be totally unaware of the people their semantic search solution could not find – a common hidden talent pool of Dark Matter profiles that cannot be tapped by any of the companies. Dark Matter profiles don’t magically appear for people who pay top dollar for a LinkedIn Recruiter account. However, one powerful feature of LinkedIn Recruiter that can put a small dent into the Dark Matter of LinkedIn is the “All Groups” search, which allows you to target people in any group even if you are not a member. At least one person who solved my Ruby LinkedIn Sourcing Challenge did so by using this feature. However, there is a Yang for every Yin – it won’t work for the large number of people who haven’t joined groups, or haven’t joined a group that you can use to reliably identify them. Regardless of level of account, no one searching LinkedIn, in any way or method, is immune to the Dark Matter phenomenon – it is a fundamental challenge to human capital information retrieval. Quite simply, you can’t directly search for and retrieve information that isn’t there to be retrieved. There are many great people that can only be found via Indirect Search methods. To be sure, the Dark Matter concept certainly isn’t limited to LinkedIn – it applies to every source of human capital data, including your ATS/CRM, Monster’s resume database, the Internet, etc. What percent of LinkedIn do you think can be classified as Dark Matter – profiles that are there, but are never found or viewed through direct search methods?